The Jewish community of Modena in north central Italy reached the height of its prosperity and cultural achievements during the seventeenth and eighteenth centuries while governed by the House of Este. Although the authorities forced the Jews into a ghetto in 1638, their privileges in commerce and industry remained protected. At its height, more than a thousand Jews lived within confines of the ghetto; by contemporary Italian standards, this was a relatively large community. While the local yeshivas attracted many students, Modena also became known in the Jewish world for its excellence in kabbalistic studies. The efflorescence of Jewish culture in Modena was reflected as well in the art of the ketubbah. 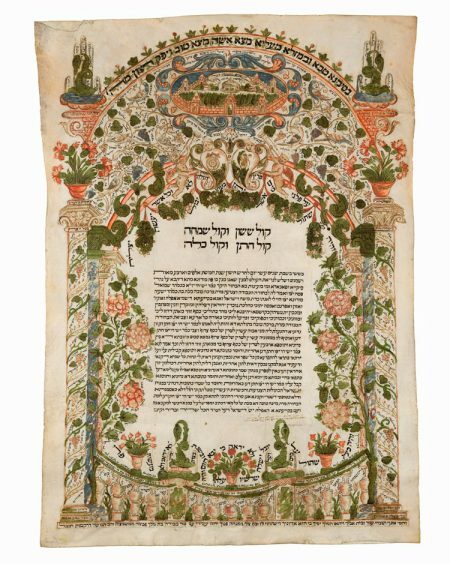 This marriage contract reveals the efforts of the Jewish craftsmen of Modena to create handsome ketubbot that joined popular designs of Italian decorative arts with Jewish symbols and motifs. Framing the text is a complex architectural structure adorned with grapevines and flowers. The central arch is supported by sets of three receding columns that give an illusion of depth. Below, the balustrade is embellished with fountains and vases of flowers, motifs that are repeated above the capitals of the outer columns and on the corbels above them. The upper section features the emblems of the two families, topped by an image of Messianic Jerusalem, based on the Venice Haggadah (1609): a walled city with seven gates and towers. At its center, the Temple of Solomon is depicted as the Islamic Dome of the Rock. Noteworthy are the six cypress trees rising above the city wall, a popular motif in much later Jewish art, alluding to the trees from which Solomon built his Temple. The messianic hope for the rebuilding of the Holy City is further enhanced by a quote from Psalms 122:3. The entire ketubbah is crowded with numerous, carefully selected, multidi- rectional micrographic inscriptions, which at times match the images (e.g., the fountains are accompa- nied by verses dealing with water and the “fountains of salvation” – Isaiah 12:3). Other quotes are verses related mostly to the wedding ideals (Isaiah 55:12, 61:10–62:7; Jeremiah 17:8; Psalms 1:3, 21:7, 45, 105:41, 128:1–6; Proverbs 5:18; Ruth 4:11–12), as well as the popular epithalamium (wedding poem) Kehi kinnor composed by the Italian Rabbi Samuel Archivolti (1515–1611).